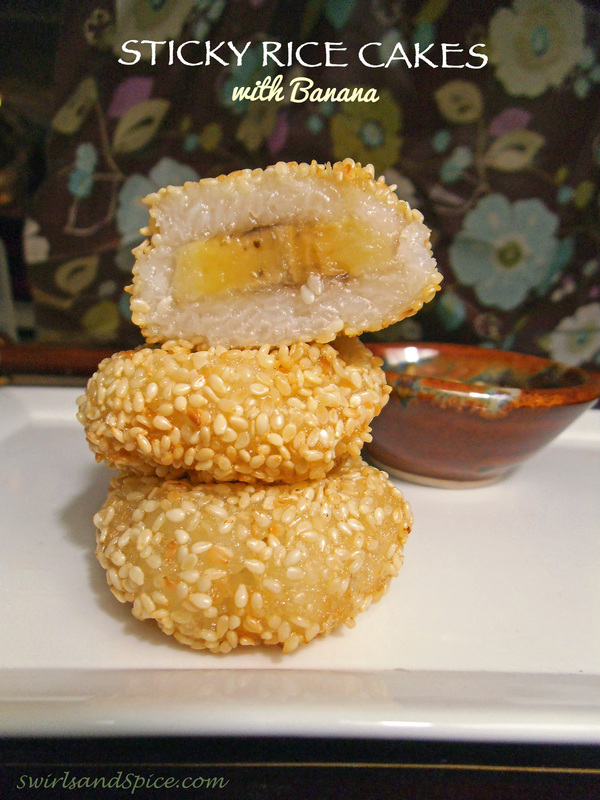 Inspired by my favourite Chinese and Vietnamese desserts, these rice cakes feature sticky rice coated in sesame seeds with sweet banana tucked inside. Frosted birthday cakes in Asia were always a dicey proposition. They almost never tasted quite right to me. But anything sweet that involved sticky rice was usually excellent. So I have come to the conclusion that it is best to seek out ethnic food that reflects the traditional ingredients and cooking methods of the area. In China and Vietnam that means rice prepared without an oven. I was craving some Vietnamese che choui nuong (grilled banana in sweet coconut milk) a while ago, but I thought it was yet another Asian treat I would have to forgo on this side of the ocean. And then I remembered ba si xiang jiao (deep-fried banana with caramel syrup), another sweet-and-sticky dessert that we often enjoyed at restaurants in China. And so this fusion dessert/snack/breakfast came to be. 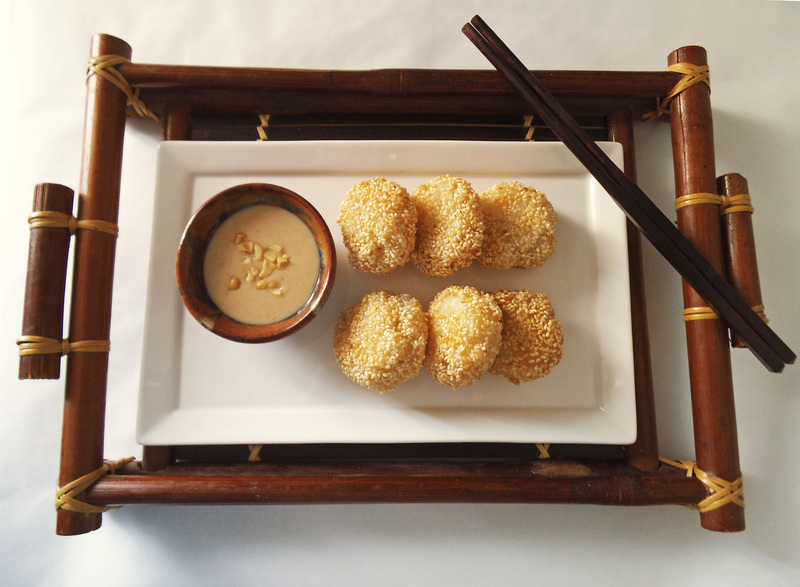 It combines the flavours of sweet banana che and fried banana dumplings with the light crunch of sesame seeds. Drain water from rice and add 1.5 cups of water. Cook in a rice cooker or covered saucepan according to package directions. Remove from heat. Make sure the cooked sticky rice is cool enough to handle but still warm and moist. Take a portion of rice and use it to cover a piece of banana (and be ready for sticky fingers). 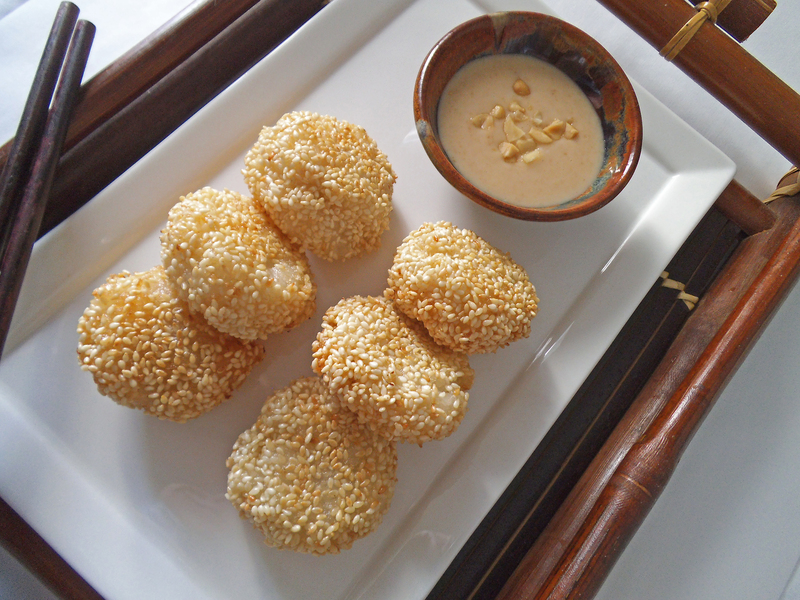 Sprinkle with sea salt to taste and then dip the rice cake into a bowl of sesame seeds until completely coated. Pour oil for frying in a pan or skillet until it is about 2 cm deep. Heat over medium-high heat for several minutes before adding some of the sticky rice cakes. Fry on both sides until golden. Remove rice cakes from oil and drain. To make a dipping sauce, whisk warm coconut milk, honey, and peanut butter together until smooth. I’m also joining Gluten Free Wednesdays this week. This sounds delicious! I love sesame seeds with anything! Those look delicious! The flavors sound incredible together. I must try! Thanks! I like that the rice cakes are not overly sweet. Just enough to let the flavours shine through. These sesame cakes look so incredibly delicious.. loving the little banana centre. Definitely craving one right now! It’s hard to go wrong with sticky rice. Where is your mom from? I’m glad to find some fellow sticky rice fans. Enjoy! These sticky rice balls look really yummy, Julia. I miss this Vietnamese flavor! You should go down to “Little Saigon” in Chicago. Several bakeries there sell che I think. I remember the birthday cakes in Far East Russia being a little strange to my American tastebuds, too. 😉 But the traditional Russian desserts were amazing! Thanks so much for sharing these with us at Savoring Saturdays! Can’t wait to see what you share this weekend! Now you’ve got me curious about Russian desserts! Wow! I have bookmarked this!! Yummy!